Dr. Haider is a dermatologist in Oakville, Ontario. He completed his specialization in dermatology at the University of Toronto. He is a fellow of the Royal College of Physicians & Surgeons of Canada. Dr. Haider also has a Bachelor of Pharmacy degree and a Doctor of Pharmacy degree. In 2004 Dr. Haider received the Canadian Dermatology Association (Barney Usher) research award. In 2002 Dr. Haider received the University of Toronto, Doctor of Pharmacy program, Instructor of the Year Award. In 2000, Dr. Haider received a research award from the department of Postgraduate Medicine, University of Toronto. In 1997 Dr. Haider received the University of Saskatchewan, Charles E Frosst bronze medal and scholarship for therapeutics. He also received the Academy of Internal Medicine of Saskatchewan research award. 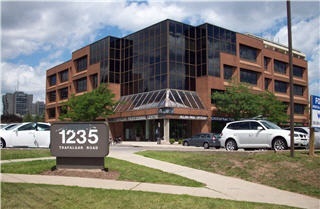 North on Trafalgar Road until 1235 Trafalgar Road, turn right onto White Oaks Blvd. 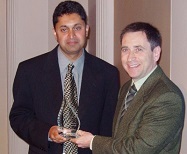 Dr. Haider accepts his research award from the Canadian Dermatology Association in 2004.